During part of my youth on the south side of Chicago, the black kids at school would torment me with the phrase, “You act like a white girl.” My obsession with Elton John and Broadway musicals was enough to dampen my awareness to hip hop culture, which prevented me from fitting into the social fabric of a black urban environment. The exclusion I felt was excruciating. These kids looked just like me, and as the only child, all I hoped to do was to connect with the siblings I never had. So I became defensive, confused and reclusive among them. This was my first introduction to a familiar discomfort zone. Being black in America felt so damn confusing. I felt cursed, because I was either policing my actions around white folks to protect their feelings, or trying prove my blackness around black folks. But I also felt privileged. Because I quickly learned how to adapt to both environments. Nevertheless, I questioned my identity repeatedly. I couldn’t quite figure out where I belonged. I made the leap to move to Colombia’s caribbean coast in 2011. I was ready to step out of my discomfort zone in search of something new. And living and travelling throughout the country for the first two years, I was brought alive. Parts of me that I thought were dead were resurrected. Parts of me that I didn’t think existed were awakened. I connected passionately with the culture. Colombia is where I found my sense of comfort. That’s when I made the decision to settle down in its second largest city, Medellin. I’d always seen Medellin, Colombia’s mainstream reputation being depicted as a narco-driven Latin American city, enmeshed in crime and violence with ruthless mafiosos staging high profile kidnappings. The Netflix series Narcos, only furthered those antagonistic attributes to the forefront. Contrarily, I would strike up conversations with travelers on temporary visits, which would comment on how much they loved the “perfect” weather, friendly culture, dope lifestyle, women, nightlife, and captivating aerial views. I found the aforementioned perspectives to contain some elements of truth; but neither encompassed the totality of Medellin’s culture. Medellin isn’t the bloodbath warzone that’s portrayed in the media. But after living there for 3 years as a black woman, I also discovered that it’s no Disneyland either. I was hired to work as an English teacher and interpreter for a leading national language institute in the heart of the city. I was nervous and excited; excited for starting a new job, yet nervous because I knew no one Medellin. I was concerned, but willing to pioneer my way through new turf. I ended up falling in love with the lifestyle I was living. I lived in a local part of town where every morning, I would wake up to the melodic chants of los vendedores ambulantes, (mobile street vendors) selling fresh fruits and vegetables just outside my doorstep. The sun would beam brightly through my bedroom window, giving me a nice morning boost. I would prepare freshly cooked meals. Transportation was accessible. The cost of living was low, and the quality of life was high. Everything I had envisioned of how I wanted my life to be in Medellin seemed to manifest. But what I had not envisioned, was being blindsided. On my first day of work, I walked into the teacher’s lounge and greeted the room with a smile and a small introduction. In return, I received silence, forced smiles and stares. Their silence spoke volumes to me. It felt strange. I was used to work culture in Colombia being friendly and relaxed. Personal boundaries aren’t hard to get past. But as time went on, I noticed that my conversations with co-workers were awkward. People remained distant, yet polite. But something about their politeness felt impolite. It was deafening. “It could be the culture here,” I would tell myself. Yet as I would sit in the teacher’s lounge, I watched the overt difference in their body language while interacting with white foreigners. They would be greeted and welcomed with a warmth and kindness that I myself had never felt. Naturally, as the only black foreigner on staff, I couldn’t help but to scratch my head and think this had something to do with race. I was working almost 45+ hours a week, so work was the place where I would have the most interaction with locals. Try as I might, click my heels, I was no longer in Kansas. Unlike other places in Colombia, I found it was achingly challenging to befriend people, despite my efforts to be open and genuine. This was discomforting. I started to throw myself passionately into my work and concentrated on educating my students. They kept me sane. I became really fond of them, and my job. I was given high evaluations and positive feedback, which led to a coordinating position to facilitate workshops for a nationwide scholarship program for Afro and indigenous students. I felt apart of something bigger than myself. Life was starting to make sense. A year and a half went by, and my bosses (a non-black Colombian woman and White American man) dropped the bomb on me and discontinued my teaching contract. I’d lost my job. I would eventually lose my apartment. A homeless vision of me panhandling on the street for pesos, flashed across my mind. I was puzzled and petrified. I came to work on time. My teacher evaluations were good. I stayed away from work gossip. I felt I had found my purpose in life. This was baffling to me. I was told that because of “budgetary issues” they could not afford to maintain the salaries of foreign teachers. And as a black woman from the U.S. and being aware of everything that encompasses, I paused. I reflected on how I could have prevented it all. Next, I got angry at myself for doubting what I already knew. Then I broke down and cried. I cried, I complained and cried some more. The life that I had perfectly sculpted, had crumbled before my eyes. I would later find out, that more foreigners were hired shortly after my dismissal. All of them white. My view of Medellin and its culture quickly melted from ambiguous to antagonistic. I was bitter and ready for war. ARE THEY BLIND? OR AM I INVISIBLE? After tirelessly seeking out ways to dispute the matter and coming to many dead ends, I eventually moved on. I got a better job, new apartment and my social life started to flourish. I explored the city more and met more people. I got involved in more activities. I would go on incredible weekend getaways. I felt content. But still, the whole vibe of, “You’re cool to hang with, but we don’t really get you,” lingered in the atmosphere. “Ustedes negros gringos no son como los de aquí. Son diferentes, más bonitos, con más cultura.” (You black folks from the States aren’t like the black folks here. You’re more beautiful and more well-mannered.) ~Waitress at the coffee shop. “Los negros no valen nada al menos que sea en la cama.” (Blacks ain’t worth nothin’, beyond the bedroom). ~Overhearing a conversation from a male co-worker. “Are they blind? Or am I invisible?” I would think to myself. I’d walk away from these conversations tired and enraged. Prejudices towards blackness were masked beneath empty compliments. My interactions with people were hollow. Fun times felt fake. I felt desired, but rarely valued. Loneliness was a constant companion. I had boomeranged my way into a similar alienation and discomfort I felt back home. But as I started reading about Medellin’s history and speaking to locals, I started to understand the why behind people’s sentiments on race. People from Medellin who are known as Paisas, are overwhelmingly classified as white or mestizo. They have established a very strong sense of regional cultural identity because it coincides with political and economic successes in the region. Medellin is the face of wealth and progress in Colombia. Afro Colombians in Medellin are the minority and steadily started emigrating from Colombia’s underdeveloped, outlying regions to Medellin during the mid 20th century, and more heavily in the 1990’s, as a result of an intensified armed conflict and massive displacement in those regions. Upon arrival to Medellin, blacks face a multitude of challenges trying to assimilate into Paisa culture due to lack of education and resources. Coming from these regions, they are widely viewed as primitive, lazy, vulgar and unclean. They wind up seeping into the lowest social class positions of society as cooks, maids and construction workers. They have been classified as invisible because they remain the poorest and most marginalized citizens in Colombia, while violations against them go unnoticed or unreported. Naturally, a black foreigner in Colombia can easily vaporize into this community based solely on appearance and get only a dose of the alienation that Afro Colombians live with on a daily basis. I would walk into certain establishments, where I wouldn’t receive eye contact from customer service representatives to be attended in emergency situations. At certain security checkpoints around the region, my documents would be given additional scrutiny with embarrassing, invasive pat-down searches, in assumption that I was a prostitute or la empleada (maid). There were times when not being waited on at restaurants felt more blatant than a simple overlook. When I expressed interest in renting or buying apartments on the market, I would often be denied information on how to proceed with the process. Bouncers at exclusive nightclubs would be quick to deny me entrance if I was alone. It wasn’t until I whipped out my intangible gringo card, putting on my best, “I don’t understand Spanish” acting skills, that reactions softened, I became less invisible and my requests were recognized. In these moments, I would reflect on what it means to be cursed and privileged as a Black American. In Medellin, my ability to adapt was a comforting privilege that saved me in desperate situations. Afro Colombians have used musical and artistic platforms to speak out against discrimination to become more visible. I would attend cultural festivals regularly, in order to escape the isolation I felt, which helped me reconnect with a part of myself that my troubling encounters had silenced. I am now living with a new pair of eyes in 2017. After being exposed to the vulnerability of Afro Colombians, I realize that discomfort is a pre-existing condition that many black communities cannot escape. We live in constant distress about things that shouldn’t be worthy of our concern such as, Will this police officer let me live today? If I wear my hair natural to this interview, could I still get the job? How can prove that I am victim of a human rights violation? Who will listen? At the same time, good things have evolved from our discomfort. If it weren’t for the discomfort of civil rights movements, maybe we wouldn’t have produced some of the world’s most influential leaders. If it weren’t for the discomfort of being told we’re not good enough, maybe we wouldn’t excel in the performing arts. If it weren’t for my discomfort in Medellin, I wouldn’t be sharing an experience that could be useful to ethnic minorities going through the turbulence of traveling and living in discomfort zones. I had many ups in Medellin. I also had many downs. I wasn’t always comfortable. But what I learned, is that comfort is nice, but not always what you need. Wade, Peter. 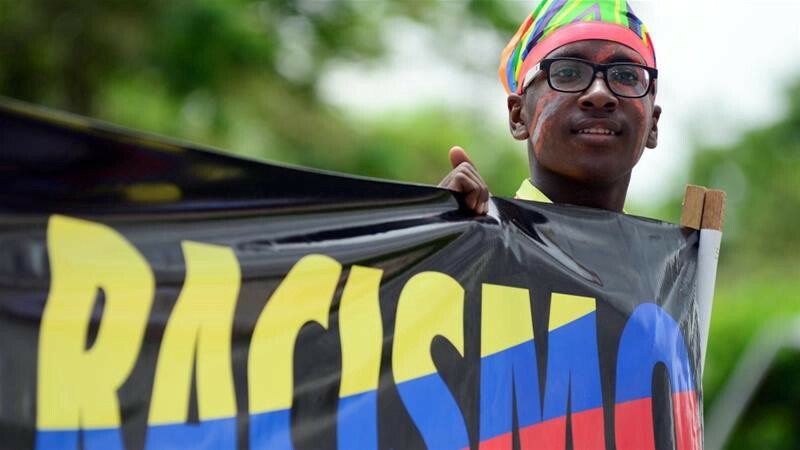 Blackness and Race Mixture: The Dynamics of Racial Identity in Colombia. Baltimore: Johns Hopkins UP, 1995. Print. Copyright © 2017. Meredith Ché. All Rights Reserved.